We believe that the Directive in its current form is a step back for the Digital Single Market rather than a step forward. These criticisms are very much in line with our own assessment of the directive and it is unfortunate that the rest of the Member States have chosen to ignore them. After this week’s approval by the Member States it is now up to the European Parliament to prevent the directive (or its most harmful element, Article 13) from being passed into law. There is no date for the final plenary vote yet, but the final showdown is widely expected to take place anytime between mid-March and mid-April. Today we are launching a new minisite called “Internet is for the people” that provides an overall assessment of the Directive on Copyright in the Digital Single Market. Our assessment takes into consideration all the key parts of the Directive. Our aim, with this project, is to present how the Directive will either empower or hurt users and creators in the digital age. The rules that regulate creativity and sharing must be fair and take into account contemporary online activities and digital practices. Essentially, the internet needs to be for the people, and key legislation needs to be based on this principle. In order to do this, we analysed nine different issues that are included (or have not been included) in the proposal for the Directive: Upload Filters, the Press Publishers Right, Text and Data mining, access to Cultural Heritage, Education, the protection of the Public Domain, a Right to Remix, Freedom of Panorama and Fair Remuneration for Authors and Performers. Each issue was then scored, allowing us to provide an overall score of the Directive based on an understanding of all elements of the proposal. Too often, the Directive is reduced just to a few controversial issues: content filtering or a new right for publishers. These are clearly crucial issues, but it is important to understand that the Directive includes other rules that can also have massive effects on Europe’s research and science, education, cultural, or AI industry–just to name a few. We decided to analyse the Directive through a particular lens: of the potential to either empower or hurt users and creators in the digital age. We are critical of views that the Directive simply attempts to regulate business relationships between two sectors, and that therefore the policy debate should be left to them. The Directive will have tremendous impact on all European citizens, who depend in all aspects of their lives on communication systems and digital tools that copyright law regulates. The internet needs to be for the people. This means that core policies, like copyright law, need to be “for the people” by design. As our analysis shows, the final proposal for the Directive will likely be a legislative mixed bag. A range of positive developments concerning exceptions and limitations – rules that grant people the freedoms to use content for personal needs or public interest goals – are offered alongside other regulatory proposals that will have extremely adverse effects across all spheres of European society. On Monday policy makers will have one more chance to fix some of the shortcomings of the proposed directive. Based on the current state of affairs it seems extremely unlikely that this will fundamentally alter the our negative overall assessment of the directive: Seen as a whole, the proposed Directive is bad, and will not make the internet work for European citizens. Last month the notorious EU Parliament vote approved almost all of the worst measures of the proposed Directive on Copyright in the Digital Single Market. It was a significant setback for user rights and the open internet. The Parliament voted in favor of Article 13, which even though it didn’t mention explicitly, would in practice force online platforms that host significant amounts of user-uploaded works to filter all content for copyrighted materials and prevent the upload of those works unless a license has been agreed to. If the platforms don’t do this, they would be liable for copyright infringements of their users. They approved Article 11, which gifts a new copyright-like right to press publishers that will allow them to control how we access and reference press publications and news stories online. The text and data mining provisions of Article 3 pretty much stayed the same, with a mandatory exception carrying through, but only one which can be taken advantage of by not-for-profit research organisations, and only for the more limited scope of scientific research. An optional addendum would permit an expanded exception applicable to all, but only if the rights holders in the underlying works don’t object to it, or arrange their own licensing requirements. Article 4, the copyright exception for education applying to digital and cross-border teaching activities, while being seriously improved over the Commission version, still contains the fatal flaw that the mandatory exception can be essentially ignored if there is appropriately licensed content made available in a Member State. To add insult to injury, the Parliament doubled down on their rights giveaway bonanza, approving Article 12a to grant sports events organizers to prohibit anyone from sharing photos or other recordings of sports events. And the new Article 13b requires that image search engines to obtain licenses for even the smallest preview images that they display as search results. There is no way around it, the outcome of today’s vote on the copyright directive in the European Parliament is a big loss for user rights and the open internet. MEPs have decidedly sided with the demands of the creative industries to hand them more control over how we access, use and share copyrighted works. Out of the seven issues that we listed this morning the European parliament voted against our position every single time. Under Article 13, rightsholders would get more control over how copyrighted works can be shared on online platforms. It will allow them to force platforms to filter content in ways that will negatively impact users rights. Under Article 11 press publishers would get an entirely new right that will allow them to control how we access and reference press publications. Under Article 3 rightsholders would get the right to prevent anyone other than scientific researchers from using computers to analyse information contained in legally accessible works. Under the new Article 12a sports events organizers would become copyright holders allowing them to prohibit anyone from sharing photos or other recordings of sports events. Finally under the new Article 13b image search engines would need to obtain licenses for even the smallest preview images that they display as search results. There are a few bright spots in the report adopted today, such as a slightly beefed up education exception and better mechanisms allowing cultural heritage institutions to provide access to out of commerce works, but on balance the result of today’s vote amounts to a substantial weakening of the public domain. In having chosen the side of the content industries MEPs have turned their back on the potential of an open internet to foster research, access to information and as a driver of creative innovation. This happens against the backdrop of serious concerns from academics that these new rights may be ineffective and will possibly even entrench the dominant position of the dominant platforms providers. 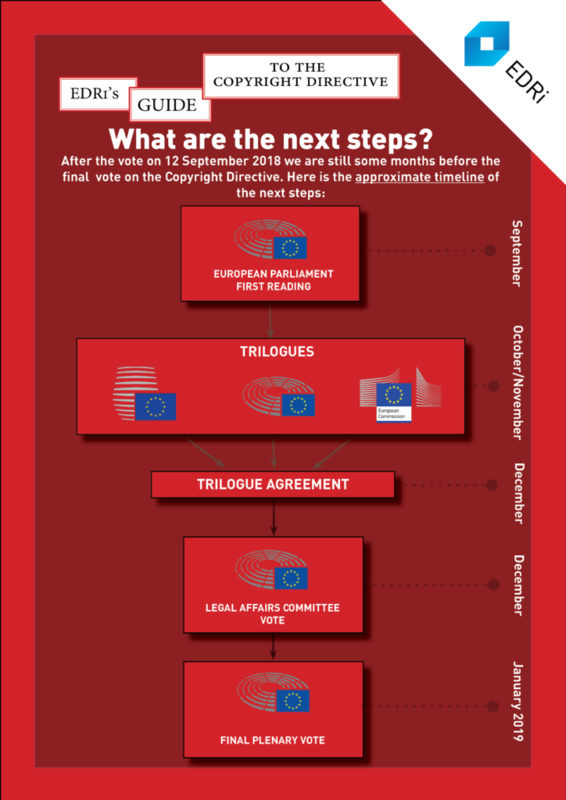 With today’s adoption of the report the path is now clear for negotiations (the so called “trilogue“) between the Parliament, the Council and the Commission (see this helpful infographic for an overview of the remaining steps). Given that on most issues the positions of the three legislators are very similar, this process, which will be guided by the Austrian Presidency, will likely be relatively swift. Once these trilogue negotiations are complete, the resulting text will once more be voted in the European Parliament. This vote, which will likely take place at the end of this year or early next year will be the last possibility to prevent (or at least limit) the effects of today’s land grab by rightsholders. Stay tuned for a more extensive analysis over the next few days. On the 5th of July a large majority of the Members of the European Parliament voted against fast-tracking the report of its JURI committee on the Copyright in the Digital Single Market directive so that the full parliament could discuss the contents of the report and make adjustments to a number of controversial provisions. This discussion has taken place over the last few weeks and tomorrow marks the day when the European Parliament will take a final vote on the report. On the table are a wide range of proposals to amend three of the most controversial parts of the proposed directive, as well as a number of attempts to address omissions in the original text. However, large parts of the JURI text, such as the exceptions dealing with education and access to cultural heritage, have been left untouched and will not be affected by Wednesday’s vote. Text and data mining: Vote for an expanded version of the exception for text and data mining in Article which would allow anyone to text and data mine all legally accessible copyright protected works. This would be guaranteed by a set of amendments tabled by a cross-party coalition called the Digital Agenda Intergroup. Not adopting their amendments would mean that Europe will shut itself off from an essential tool for scientific, societal and economic progress. Press publishers right: Delete the unnecessary and counterproductive Article 11, but it deletion is not possible, limit the most negative effects by refusing to grant press publishers additional rights that will hinder access to knowledge. This would be guaranteed by sets of amendments proposed by the Digital Agenda Intergroup and by the Greens/EFA political group. Upload filters: Ensure that the attempts to address an imaginary value gap driven by the music industry by introducing mandatory upload filters do not damage the open nature of the internet and limit the freedom of (creative) expression online. In addition to deletion of Article 13 the damage can be limited by adopting amendments proposed by the Internal Market and Consumer Protection committee or the Digital Agenda Intergroup. User-generated content: Vote in favor of the new amendments that clarify that users may engage with copyrighted works through remixes, memes and other types of user-generated content (UGC). Support for UGC was indicated in the JURI recitals, but left out of the article text. There are amendments tabled the Digital Agenda Intergroup as well as several MEPs including Cavada, Reda, Adinolfi, and Maštálka. Freedom of Panorama: Vote in favor of new amendments that clarify the ability for European citizens to take and share photography of artworks and architecture in public spaces (freedom of panorama). There are amendments tabled by the Digital Agenda Intergroup as well as MEPs Maštálka and Reda. New rights for sports broadcasters and image search: Vote against the additional copyright protection gifted to sports events organisers snuck into the JURI report, as well as the addition of a licensing requirement for image search engines. Neither of these amendments were debated nor received a sufficient level of scrutiny by the Parliament, and both would result in substantial expansions of the scope of copyright that must be opposed given the absence of any evidence supporting such measures. Support for the public domain: Vote in favor of the amendments that add a positive definition of the public domain to the EU copyright framework. Copyright law takes a big part of its legitimacy from the fact that it creates temporary exclusive rights and this fundamental principle deserves explicit recognition in EU law. MEPs should support the amendments introduced by MEP Adinolfi. Act now: Tell your MEPs that copyright reform must facilitate access to knowledge! It is less than a week before the decisive vote on the proposed Directive on Copyright in the Digital Single Market. In the past few weeks MEPs have tried and failed to come up with a compromise position on the most controversial element of the directive proposal, the upload filters for online platforms that would be mandated by Article 13. As a result all options ranging from filtering obligations that would cripple online platforms to the deletion of Article 13 remain on the table for next week’s vote. On a positive note, MEP Dutch Marietje Schaake has tabled positive amendments to Article 3, which bring the exception as close as possible to the rule “The right to read is the right to mine”. We have been univocal in our conviction that the upload filters mandated by Article 13 are a terrible idea. They would limit the freedom of expression of European internet users and creators, and allow big corporate rightsholders to establish themselves as gatekeepers of cultural expression that would limit cultural diversity online. We are also concerned about the effects that filtering requirements would have on access to knowledge. Legal affairs committee sells out user rights to big content & big tech. This morning the Legal Affairs Committee of the European Parliament voted on the report on the proposed Copyright in the Digital Single Market Directive. The results are in and they are not pretty: MEPs have adopted Article 13 which would force open platforms operating in Europe to install upload filters. They have also adopted the controversial press publishers right (art 11). As a bonus to rightsholders they granted more rights to “sports event organisers” and adopted a provision intended to force image search engines to pay for displaying thumbnail images as search results. This amounts to a massive power grab by rightsholders who will enjoy much more control over how we use the Internet to communicate, share, create and inform ourselves. It is a big step away from an open Internet towards an Internet that functions as a distribution channel for mainstream culture. It is a huge loss for European cultural diversity and the freedom of expression online. It is telling that the MEPs in the JURI committee have also voted against all attempts to give users more rights. Proposals to introduce EU wide freedom of panorama and to allow the use of protected works in User Generated Content (both of which would merely bring the law in line with reality) were voted down. The MEPs adopted a number of small improvements for users in the fields of education, access to cultural heritage and with regards to Text and Data Mining but most of these come with significant drawbacks. The education exception contains a license priority clause that allows rightsholders to turn off the exception and dictate problematic licensing terms to educational users, which creates a dangerous precedent for users’ rights and goes against the CJEU ruling on this issue. The Text and Data Mining (TDM) exception is limited to scientific research purposes only. The expansion that would open TDM to everyone for every purpose (which is crucial for the development of technologies such as artificial intelligence in the EU) is merely optional and will not apply across the EU as a whole. Taken as a whole, the JURI committee’s vote shows an utter disregard for the rights of citizens in the digital environment. It is telling that both the Civil Liberties and the Consumer Protection committees have prepared much more balanced reports that have been completely ignored by the members of the Legal Affairs committee. This shows that lawmakers still treat the rights and interests of citizens and creators as spare change in the the fight between big content and big tech. Today’s round has clearly gone to ‘big content’ in spite of warnings from pretty much anyone other than the rightsholders that this outcome will have disastrous consequences for the open Internet and our freedom of speech. Citizens’ freedom of expression should not be the function of an arrangement between rightsholders and big technology companies. It is a right that needs to be defended on its own merits and it is extremely worrisome that EU lawmakers have effectively decided to give big technology companies – that are based outside of the EU – the responsibility to decide how European citizens can express themselves online. Tell your MEP to #fixcopyright tomorrow! 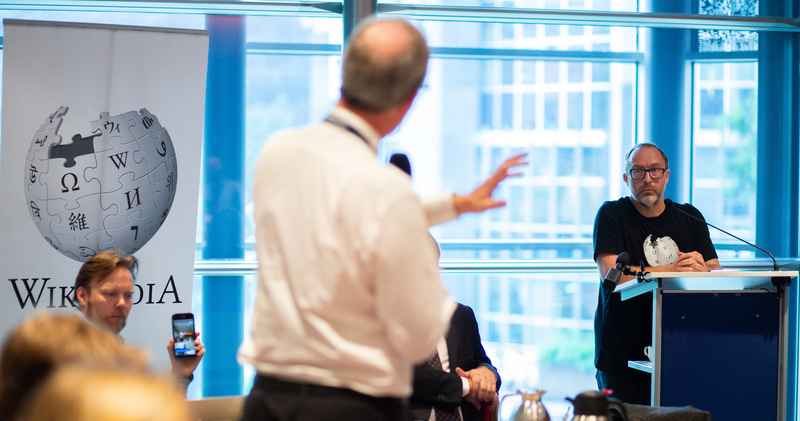 For more than a year the discussion in the European Parliament has narrowed down on a number of key topics. The most attention has gone to those areas where the ideas introduced by the European Commission have the potential to break the open Internet and limit freedom of expression and the free access to information. Both Articles 11 and 13 remain hotly contested to this very moment and it is important that you continue to tell the members of the JURI committee to Save Your Internet by voting against the compromise proposals proposed by the Rapporteur, Axel Voss, and support the alternative compromises proposed by the Greens instead. On a more positive note there are a number of issues where the JURI MEPs can make a positive difference. The Commission’s proposal was a huge disappointment with regard to empowering users and protecting the Public Domain but members of Parliament have worked hard to put proposals up for vote that would correct this. During tomorrow’s vote the JURI MEPs should vote for the alternative compromise amendments that would introduce Europe-wide exceptions allowing anyone to take and share pictures of artworks located in public spaces (the so-called freedom of panorama) and to use pre-existing works in remixes and other forms of “user generated content”. In addition, MEPs should vote in favor of the compromise amendments on articles 7-9 that strengthen the proposed mechanism that would allow cultural heritage institutions to make available out of commerce works. Lastly, the compromise amendment for article 5 contains a recognition of the principle that reproductions of works in the public domain should stay in the public domain. Finally, there are a number of issues where the Commission’s proposal was severely lacking and where the members of Parliament have not managed to put forward a response that fixes these flaws. As proposed by the European Commission, both the exception for Text and data Mining and the exception for education were at best mixed blessings and, unfortunately, the Parliament has not found a way to fully address their shortcomings. The proposed optional exception for TDM that applies only if the right has not been reserved does not constitute more than a band-aid on the gaping wound caused by the Commission’s proposal for an limited exception (that, in effect, prevents anyone except researchers from engaging in Text and data mining). Given that there are no more substantial solutions on the table we still encourage MEPs to vote for the compromise amendments on articles 3 and 3a even though we are convinced that the only sensible option is to embrace “the right to read is the right to mine” approach. With regards to the education exception, the European Parliament’s compromise amendment fails to address the core shortcoming of the Commission’s proposal. The new mandatory exception should improve the very fragmented existing legal framework in the EU and benefit learners and educators alike. Unfortunately, the compromise amendment up for vote tomorrow leaves intact the licensing override that will negate the purpose of having a mandatory exception. We will continue to advocate for limiting reliance on licensing as a method to ensure access to educational materials. It has become clear from our own research that licenses do not benefit education. They impose burdensome obligations on schools and include unfair or even abusive terms. Time is running out to tell the MEPs in JURI to act. Tell them to back stronger exceptions, safeguard the public domain and save the Internet via saveyourinternet.eu or changecopyright.org now! Rescuing TDM from the reform wreckage? Last week’s big news was dominated by the agreement from COREPER on a negotiating mandate for the proposed Directive on Copyright in the Digital Single Market. The verdict: Member States have agreed on a text that fails to address the biggest shortcomings of the Commission’s proposal, and in a number of ways actually makes it worse. But recently Rapporteur MEP Axel Voss also published a his first proposal for a compromise amendment on Article 3, the exception for text and data mining (TDM). Since the release of the original Commission proposal, we’ve criticised the TDM exception as not going far enough to achieve its intended objectives, because it would limit the beneficiaries of the exception only to research organisations, and only for purposes of scientific research. While there were interesting amendments floated by a few of the Parliamentary committees, it seems that few of the progressive changes have been seriously considered by JURI. In parallel, the Council presidencies have not done anything that would significantly improve the situation, either, with their main contribution being the introduction of an optional provision, often referred to as “3a”. This additional arrangement would cover TDM activities that fall under temporary reproductions and extractions, and would apply to beneficiaries beyond research organisations, and for uses other than scientific research. But those acts would be limited in that they only apply for works for which rights holders are not explicitly prohibiting such uses. Voss’ compromise amendment is a mashup of Article 3 of the Commission’s proposal and Article 3a of the Council text. In opposition to his approach in many other areas, the changes here seem to be a reasonable attempt at arriving at a compromise between those who agree with the Commission’s original narrow approach and those (like us) — who argue for a much broader exception that allows anyone to engage in text and data mining for any purpose. The devil of course is in the details of the proposed text. Will Parliament step up to defend user rights? Last Friday the Committee of Permanent representatives of the Council (COREPER) agreed on a negotiating mandate for the proposed Copyright in the Digital Single Market directive. The agreed upon text does not substantially differ from the latest compromise proposals that we have discussed here before. Unfortunately that means that the Member States have agreed on text that fails to address the biggest shortcomings of the Commission’s proposal and in a number of cases actually makes it worse. Over the past one and a half years the Member States, driven by a mediterranean maximalist coalition (France, Italy, Spain and Portugal) have doubled down on the Commission’s highly problematic proposal to impose upload filters for open internet platforms. As we have explained here, the version of Article 13 adopted by the Member States would create a new parallel liability regime that puts the creative expression of platform users at the mercy of a censorship machine run by platform operators in collusion with rightsholders. Driven by the same mediterranean maximalist coalition the Member States have insisted on a narrow, innovation-hostile exception for Text and Data Mining. This approach flies in the face of the EU wide ambition to become an important player in the area of machine learning and artificial intelligence. At the insistence of more forward-looking Member States the Council text also includes an optional exception that allows TDM for a wider set of purposes and beneficiaries, but this comes at the cost of further splintering user rights in the EU. Under intense pressure from Germany the Member States have maintained the introduction of a new ancillary copyright for press publishers against a near-universal academic consensus that such a right will endanger the freedom of information without benefitting press publishers. In a small improvement of the Commission’s proposal the new right would now last for a maximum of 2 years and would not apply retroactively.